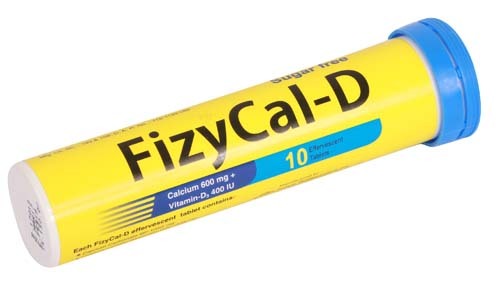 FizyCal-D®: Each effervescent tablet contains Calcium Lactate Gluconate 1358 mg and Calcium Carbonate BP 1050 mg equivalent to 600 mg of elemental Calcium and Vitamin D3 400 IU as Cholecalciferol USP. Calcium is useful for the prevention and treatment of Osteoporosis and associated fractures. Vitamin D is also essential for healthy bones as it aids in Calcium absorption from the GI tract. In addition to this it stimulates bone formation. Clinical studies also show that Calcium and Vitamin D has synergistic effects on bone growth as well as in Osteoporosis and fracture prevention. Dissolve FizyCal-D® effervescent tablet in a glass of water and drink immediately. Do not swallow or chew the tablet. Patient with a history of renal stones urinary calcium excretion should be measured to exclude Hypercalciuria. During long-term administration of FizyCal-D regular blood and urine calcium levels as well as kidney function should be monitored regularly. Consultation with physician should be required while using other Calcium and Vitamin-D preparation, having previous history of kidney disorder and certain lung diseases e.g. Sarcoidosis/ Besnier-Boeck disease. FizyCal-D effervescent tablets can be used during pregnancy, in case of a calcium and vitamin D deficiency. However, for supplementation starting during the third trimester of pregnancy, the daily intake should not exceed 1500 mg calcium and 1000 IU vitamin D. FizyCal-D® effervescent tablets can be used during breast-feeding.